Tuscarawas County contains 567 square miles (363,290 acres) of land and is home to 92,400 citizens. There are 233 industries in the county, with the median household earning an income of $42,850. Major employers include businesses in the sectors of food services, state and local governments, nursing and residential care facilities, and wholesale trade. Figure 1. Forest industries contribute 4.57% to Tuscarawas County's economy[2,3]. Figure 2. Tuscarawas County contains approximately 197,000 forested acres, which is 54.3% of the total land cover[1,3,5]. Figure 3. Tuscarawas County's farmland and forestland production, 2010. This figure does not include harvests from government lands. Figure 4. Tuscarawas County's forestland is 97.3% privately owned, nearly 192,000 acres. Figure 5. Tuscarawas County contains 1.14 billion board feet of sawtimber. The top five species make up 68.6% of the total volume. Figure 6. Direct economic impact of Tuscarawas County's forest industries, 2010. 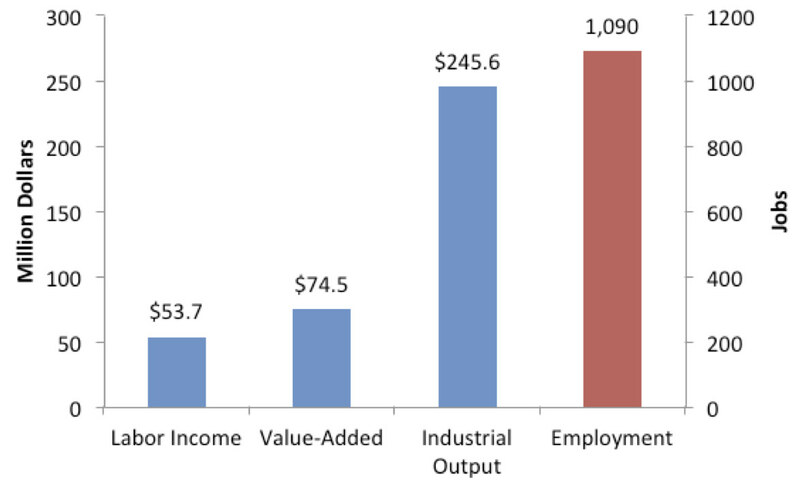 Labor income, value-added, and industrial output are represented on the left Y-axis, and employment is represented on the right Y-axis. Figure 7. Tuscarawas County's forest industry employers by sector, 2010. Figure 8. Direct tax impact of Tuscarawas County's forest industries, 2010. Table 1. Direct industrial contributions within Tuscarawas County’s economy, 2010. The IMPLAN® model’s 440 sectors were aggregated into 12 industries by each sector’s 2-digit North American Industry Classification System (NAICS) code number. United States Census. 2010. United States Census quick facts. quickfacts.census.gov/qfd/states/39/39157.html. 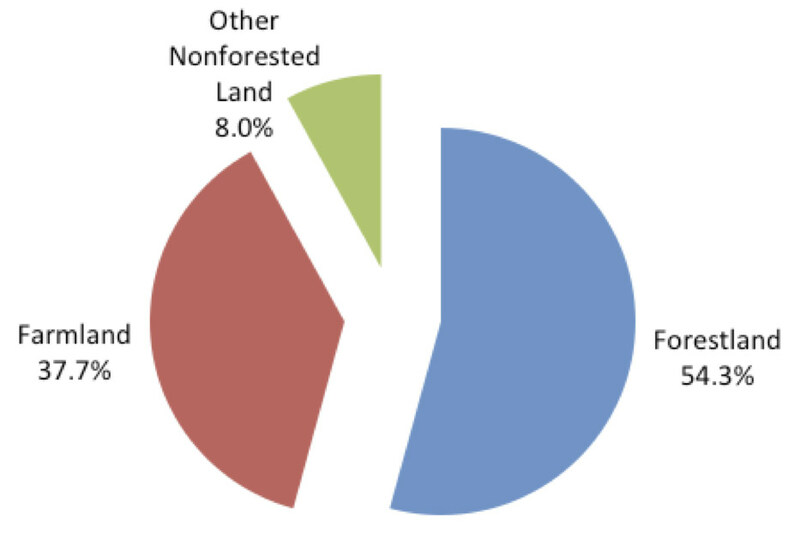 United States Forest Service Forest Inventory and Analysis. 2012. Tuscarawas County 2011 forest survey database. apps.fs.fed.us/fido/standardrpt.html.